The old-fashioned garden annual known as Love-in-a-mist takes its name from the delicate, asparagus-like foliage that surrounds the flowers both in bud and in bloom. But asparagus doesn’t come to mind when I encounter Nigella’s bud. Instead, I see the shape of my favorite dumpling: char siu bao, a pork-filled delight I first met in San Francisco’s Chinatown, where I was introduced to Dim Sum. Dim Sum is variously translated as “dot heart,” “to touch the heart,” or “a light touch on the heart.” As part of a garden buffet, Love-in-a-mist provides that touch as well. 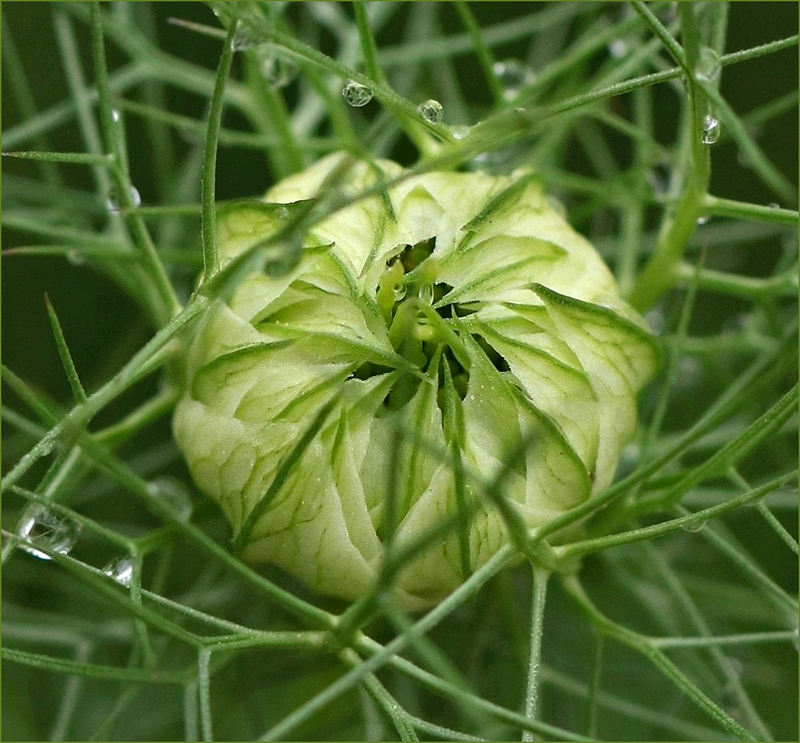 I love Nigella – both in bud and in flower. Have you ever tried making Baos? I like the egg custard ones best……until I tried to heat one in a microwave (instead of steaming) and it caught fire and burnt to a blackened crisp. I like the Char Siu Baos also, but there are good ones and not-so-good ones, so I generally stick to the Pork. I’d never seen Nigella until last year. It reminded me a bit of my grandmother’s bachelor buttons, since the patch was the same mix of pink, white, and blue. I’ve never tried making anything served on a dim sum tray. There are some things — including chicken fried steak and gumbo — that I leave to the experts. There’s a little something extra that seems to go into a dish when it’s made by someone from that culture. Now, if it’s Swedish you want, I can oblige! The linked article says that people in Turkey, the Middle East, and India, use this plant’s seeds as a seasoning. Have you tried it, or its relative Nigella sativa? I haven’t. In fact, I’ve never seen the seeds. I was introduced to this plant nearly at the end of its season, and this was my first and only encounter with it. I didn’t know its seeds were useful in the kitchen until I started reading about it and, for that matter, neither did the owner of the garden. “Love in a Mist” the best name, much nicer than its other common names: “Love in a Puzzle,” “Jack in a Prison,” “Devil in A Bush,” and “St. Catherine’s flower” for the resemblance of the shape of the flower to the wheel on which she was executed. The seeds of N. damascena are aromatic, sometimes used as a mild-flavored pepper substitute, and there are some reports that they are slightly narcotic. I’ve never tried N. sativa. When I found it also was called “Devil In A Bush,” I laughed. How two such opposite names could be given to the same plant is interesting. I couldn’t find any real explanation; the articles I read simply noted the oddity and moved on. “Love In A Puzzle” makes more sense. The friend who was growing these already has determined to try some of the seeds as a seasoning this year; she didn’t know they could be used that way. A stunning photo, Linda. I just adore the common names of flowers, so poetic. I imagine that this flower would fry here, but maybe in winter/early spring it would bloom?? I read that its bloom is short, only two to three months, and my friend’s experience with it supports that. This photo was taken in April outside Kerrville, and she said that was the middle of its season: March-May, for her. It might be a nice early spring flower for you. She says it attracts various pollinators, so that’s a double plus. I’ve read that it does nicely in a pot. Now I’m imagining a nice, large pot with four seasons’ worth of annuals. Aren’t I helpful? By the way — this weekend’s birds included an American kestrel and robins! Just hearing the robins was enough to thrill my midwestern heart. Your photo is beautiful and really captures the captured bloom. I have never tried Dim Sum but it has turned up in my reading recently. Now I’ll have to try it. It’s fun to go to a dim sum restaurant with a group, so everyone gets to taste more of the offerings. It’s especially fun at a traditional place, where they roll carts loaded with treats from table to table, and you pick what you want. The only bad thing about comparing this bud to dim sum is that its made me want some, and that means a trip into Houston. We have good Indian, Thai, and Chinese food locally, but no dim sum. That sounds like it might be a heavy toll to pay for dim sum. It is the same here~Chicago is a mecca for great food, but we country bumpkins prefer life 50 miles away. Luckily we have good Thai. and pizza. Lots of pizza. A very different appearing flower that apparently I have never seen. It seems delicate and quite unusual. I will need to research on Google. Something new to learn about. It certainly is delicate. Its described as an heirloom garden plant; I read that its history goes back to at least 1600 or so. I’ve only seen it once, and I really regret that my photos of the flowers aren’t particularly sharp. But, I’m going to post at least one next, just so people can see the flower. There are fancy cultivars, but I think the “plain” flower is lovely. I love this photo!!! It looks like the germ of a complex idea, in a matrix of axons. And it also does look like a dumpling, which I’ve loved since I was in Hong Kong, and I’m now starving for some!! Really excellent photo. I was pleased with this photo. The reflection of the ferny foliage in the water drops was a plus. Now that you’ve nudged me away from my dumplings with your axons, I can see that, too. I always wondered what the shape of a thought might be: this could be it. I’m with you, on wanting some dumplings. I have to head into Houston to find them, but they may be closer at hand for you. The common and formal names for this are really nice, too. So that’s what we need – – a really good garden conservatory, that serves dim sum. Perfect — and tea from little bowls made by the artists at Corning. It seems that Seattle is the other hub for glass artists – – I noticed on the last visit, how many artists are there. Another city on my list to visit! I’ve never had dim sum but I think it would be too pretty to eat! What? This, from the woman who can happily devour macarons and Pavlovas? No matter how pretty they might be on your plate, Jeanie, one bite and you’d be right there with the rest of us: eating and smiling. It does open, Curt, and I’ll show that in the next post. They remind me of bachelor buttons, since they come in blue, white, and pink. I mostly don’t eat artichokes, although I use the hearts in some recipes, but now that you say that, I can see the resemblance. Maybe that’s a variation on the old saying — we not only are what we eat, we see what we eat. Looking forward to it Linda. Have you ever seen a blooming artichoke, BTW? I haven’t seen a blooming artichoke, Curt. My experience with artichokes has been pretty much limited to the produce aisles. You’re certainly right that experience of a plant or animal increases our awareness of them. After saying at least a half dozen times in my post about the turkey vulture that I either haven’t seen, or haven’t recognized, a black vulture, what did I find perched on a branch yesterday? An obviously loving black vulture couple, just whiling away the afternoon. I was tootling along at about 50 mph when I noticed them — of course I laughed. Fitting that love in a mist would touch the heart by association with Dim Sum. Never knew that about Dim Sum or had any instinctive connection to such an interpretation. If I hadn’t had a couple of years of regularly eating dim sum, I’m sure I never would have made the connection, either. Now, I can’t see it as anything else. Even the traditional fruit dumplings I grew up with don’t seem like a good parallel; they never had that pinched-together-at-the-top look to them. By the way, I finally found a friend for Plato, and I’ll be posting his photo a couple of entries down the road. I’m anxious for you to see him. In his own way, he’s just as striking, and has that same looking-down-the-nose expression that I so much loved with Plato! The open blue flowered version reminds me of bachelor buttons. It’s that same purple-leaning blue. A very unusual flower, this. I was surprised there was no referent to a crown of thorns in its name. In bud, the spikey bits very much resemble thorns. . The thorny references probably never got made because the flower is so soft to the touch. The greenery is more fern-like: delicate, and not at all threatening. Like you, I thought of bachelor buttons: partly because of the color and partly because of the nature of the bloom. I’m anxious to see more of the plants this year, and get some better photos of the flowers. It so happens, I just bought a box of Chinese prawn dumplings. The shopper behind me had bought two boxes and told me he can’t get enough of those dumplings. “They come with a nice sauce”, he added. They are hand-made but of course look nothing as so beautiful as the love-in-the-mist as shown above. While your prawn dumplings may not be as pleasing aesthetically as the love-in-a-mist bud, they do have the great advantage of being edible. No matter how great the sauce, I don’t think the buds would be as satisfying. If the dumplings are tempting to Helvi, that would be the greatest satisfaction of all. With all of the foliage around it, it’s like a tantalizing love that you can’t quite reach. It does look perfectly secured, doesn’t it? It was my only day to see both the flowers and the buds, and it was a wet, windy day, so I was pleased to be able to capture this lovely image. I thought of you yesterday when I came across the first buttercups I’ve seen this year. They actually were in a field devoted mostly to cows, which wasn’t nearly so delightful as buttercup ridge, but it was fun to see them. While I was looking at the buttercups, I heard some robins: proof that spring is on the move, despite our temperatures. Wow, signs of spring already! I have been thinking about Buttercup Ridge lately, but there is still over a foot of snow over all of it now. Spring will be a little late arriving here this year. This has been an interesting year for us. I found a couple of spikes of blooming goldenrod yesterday, but also woke up to a winter weather advisory for our area: rain, and more cold, which may mean ice. It certainly will mean that the plants come back into the living room. I know Nigella, I know dim sum (and I’m very fond of them both! ), but I didn’t know those name origins and associations. I love it! And what a lovely image, it really encapsulates that idea of the center, the heart. It’s occurred to me that I know a Nigel, but I’ve never known a woman named Nigella. It’s a beautiful name, for a beautiful plant. Once opened, my association changes radically; I’m going to post an image or two of the opened flower this morning, and you can see what you think. This would be a wonderful day to indulge in dim sum and hot tea, but there’s no going in to Houston to get it. There’s a freezing rain falling, and reports of icy roads and bridges already are coming in. As dim as the weather is, I’ll settle for some tea! I heard about that icy weather you’re having – perfect day for tea. Do you like black tea? I found one I love, and managed to locate a source nearby – Barry’s – it’s Irish. Makes a great strong, morning cup. I picked up some good, old-fashioned Constant Comment yesterday. I used to enjoy it, but the quality declined and I stopped drinking it. I’ve heard that it’s back to its stronger, more flavorful self — I’ll find out! I used to like that one, too. I hope it satisfies! Another one I haven’t heard of — well done, Linda! You’re right, its foliage does look like wild asparagus. Hard to believe y’all have these things growing while we’re awaiting more snow. Sigh. You’ve just brought something new and important to my mind, Debbie. I need to post something about the date the photo was taken, too. This actually is from last April; that should make you feel a little better! You’re not the only one awaiting more snow. We have winter weather warnings up, bridges and overpasses already are icing up, and school has been cancelled. There’s more sleet, freezing rain, ice, and snow on today’s menu: dim sum would be much better. Looks like everybody’s sharing in the misery this year, Linda! Haha, great comparison! Nevertheless it seems to be a spectacular looking flower. Was this found wild or “contained”? This was in a friend’s garden. It’s native to southern Europe, north Africa, south and southwest Asia, and from what I’ve read doesn’t seem to naturalize here. It apparently is a favorite for cottage gardens and such; it’s considered an “old-fashioned” flower, like my grandmother’s bachelor buttons and zinnias. My association with the opened flower is quite different; I’ll post at least one of those today. I’ve grown this in the past, and know it from when there was ONLY the blue version, far and away my favourite colour. As far as I’m concerned, it’s worth growing even if for a short flowering season, as the dried pod are very attractive, and they self-seed wonderfully without becoming a weed. Delicate looking but quite resilient. I’m hoping to see the pods this year. I’ve only seen the plants on this one day, when I managed to get photos of both buds and flowers, despite the falling rain. The flowers I saw were a mix of pink, blue, and white, and charming as could be. Your comment about there being only a blue version intrigued me, since I’d read that the flowers can be white, yellow, pink, pale blue or pale purple. It seems there are several species: one of which is a more vibrant blue. You’re right about the self-seeding, for sure. The friend in whose garden I found these says she planted them several years ago, and they just keep coming up without any real tending at all. It is gorgeous. I can’t believe I’ve only seen it once — on the day I took these photos. This year, I’ll be on the lookout for it. My friend had pink, blue, and white in her garden, so I suspect that’s what will be there this spring. I read that it self-seeds quite well, so it will be interesting to see what pops up. Weird flower pod – probably where many sci-fi writers got inspiration? That is one advantage of a rainy day: water droplets. As for science fiction, take a closer look at the outside of the bud. See all those little veins? We think it’s a plant — but is it, really?